Full disclosure: I’ve never really liked hand-held games. I’m a console girl, and I love my XBox, thankyouverymuch. And sadly, even though the Wii was cool at first, it failed to impress me overall. We ended up selling ours after a few months since we just didn’t get much mileage out of it, unlike the XBox which has become the cornerstone of our family media center. That said, the Nintendo DSi XL is surprisingly awesome for a myriad of reasons. Initially, it was just awesome for me. In June I wrote about the America’s Test Kitchen game and the yummy recipes we made (with the whole family) over at GeekDad. In a rather surprising way, the game (and the recipes) made an impact on my kitchen regimen. However, considering how many other games I wanted to play, and my general obsession with Dragon Age which lasted the better part of the year, I really hadn’t anticipated on using it beyond the review. Anyway, he took to the DSi XL remarkably. At first I just let him play around with the sounds and drawing games built in to DSi, but then I made a leap. I took him to a used book and games store and got him a game for a whopping $4. Littlest Pet Shop has since become a staple in his entertainment. His desire to learn to read has tripled since he’s been using the game, as he wants to read the scrolling text, and he’s absolutely addicted to helping, playing, and interacting with his animal friends. He’s even become more attached to his toys of the non-car variety, in many ways because, I think, he sees them in a different light since the game. Now he can’t go to sleep without a half-dozen of his furry “buddies”. Yes, four is a little young to be using the device. And I do have to watch out that he doesn’t spend too much time on it. When he’s focused on something, he’s really focused. But between helping him to read, developing a deeper nurturing instinct, and improving his motor skills, I’d say that the DSi XL has far more good things to contribute than otherwise. All things in moderation, after all. He’s never thrown it, and, as far as I can tell, the only damage done is a missing stylus. But he’s four. He’s learning. 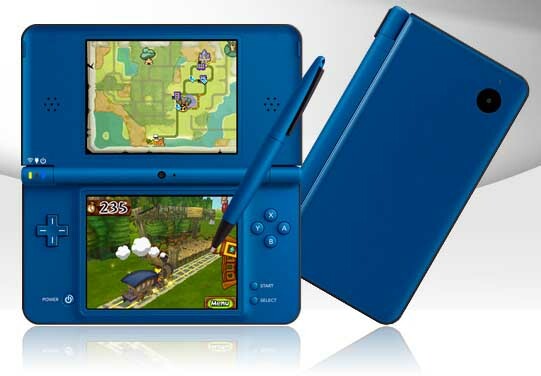 So whatever the age of the geeks on your list, you can rest assured that a DSi XL is a good buy. With the right games, I’d say this is a great fit for anyone. I’m a huge fan of the bigger screen, hence the XL part, which is particularly good for those with little eyes and hands or, conversely, those with eyes that are not exactly as dependable as they used to be.